BASCO, Batanes, January 16 (PIA) -- The women sector in Itbayat Island who are engaged in different livelihood projects chose to preserve and promote the traditional Ivatan craft called 'yuvok' or basket with a suspender. 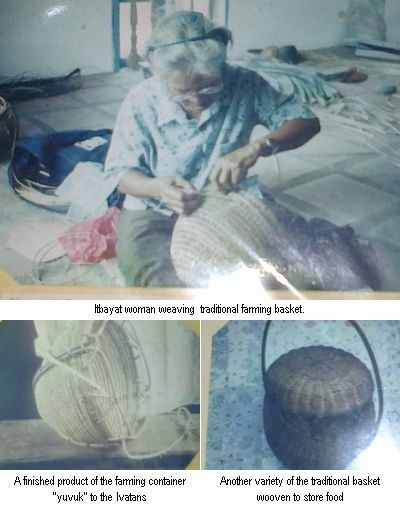 Rosalia Castillo, former employee and resident of Itbayat said unemployed middle aged women, including the senior citizens, engage in basket weaving of farming containers for a living. These are made of indigenous 'nito' vines. Castillo said it will take one week for a seasoned basket weaver to finish one basket which costs P350. Tourists who buy the farming baskets has introduced other use by repositioning the basket in “bottoms-up” position. Some said they will not use it as farming container but as lamp shade and as decorative materials.